I was going through the St. Louis Post-Dispatch from 1958 at the library and came across this advertisement with the excellent bend of font on "Musial" and "Biggie's" to look like the stitches on a baseball. I've got baseball fever and I'm itching for the sounds of my favorite game coming through the A.M. frequency on a cheap speaker. I'm ready for Cardinal baseball and I thought I'd dig into the restaurant I just learned of from an ad in an old newspaper. Can you image a current St. Louis Cardinal who would invest in St. Louis? Can you image a St. Louis Cardinal living in St. Louis? Musial lived in a modest ranch home in the St. Louis Hills Neighborhood from 1948-1965 before moving to Ladue, Missouri post-retirement.Those days of all star, face of the franchise players living in the city of St. Louis are gone. New money these days tends to prefer the gaudy McMansion. For my money, Gibson and Musial are the two greatest Cardinals of all time. Willie McGee and Yadier Molina are my favorite Cardinals, but that's due to my age more than anything else. Those two were the best. Musial seemed like a great guy. How many city's name a major Interstate bridge crossing the biggest river in North America after a baseball player? St. Louis does. Julius “Biggie” Garagnani was the son of an Italian immigrant miner. Born in 1913, he grew up on The Hill, the same neighborhood where Joe Garagiola and Yogi Berra grew up. In spite of only having a 4th grade education, he was business savvy and very active in St. Louis Democratic politics. Twice he served as a delegate at the Democratic National Convention. Garagnani and Musial became close friends and he served as a financial advisor and mentor. 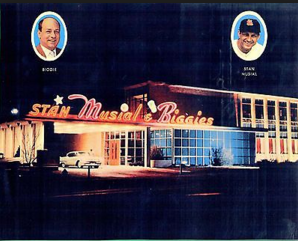 His restaurant, Club 66, became Stan Musial and Biggie’s after he sold a half share to Musial. The arrangement benefited both men. Musial’s name was good for business, and it provided Musial an income outside of baseball that would last after his career was over. And no, this is not the same Biggie that still has a place at Watson Road and Arthur Avenue in the city's southwest side. 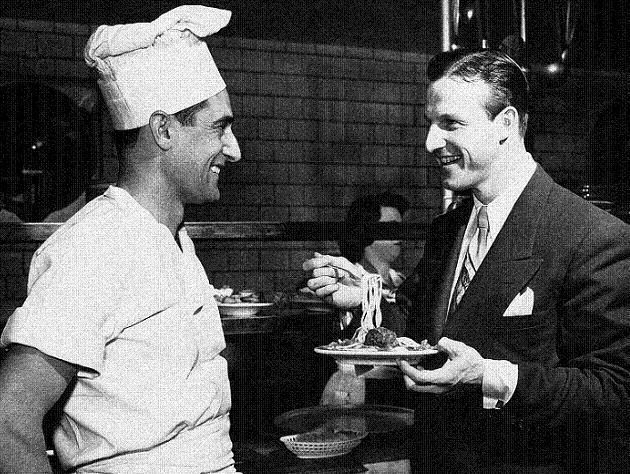 Musial also had a restaurant in the suburbs outside of St. Louis in the Hilton St. Louis Airport hotel at 10330 Natural Bridge Road. Today, a medical building sits in that spot, at Chippewa and Winona. Steaks and Italian fare was on the menu. In 1960 the restaurant moved to Oakland Avenue, just south of I-64 near Forest Park where the St. Louis Science Center now sits. 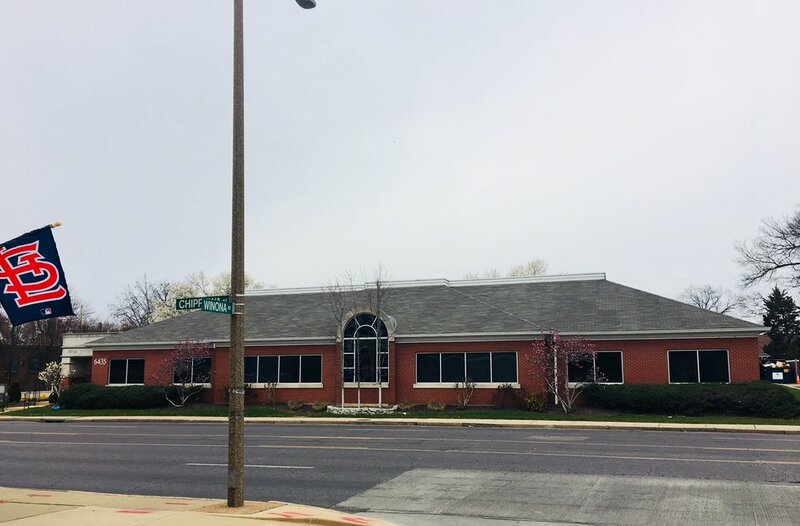 "The first floor featured Musial memorabilia in the lobby and the second floor had a large banquet room. Musial would frequent both locations, signing autographs and giving free meals to anyone who could prove they were from his hometown of Donora, Pennsylvania. The businesses thrived into the 1970s, but ran aground as Musial withdrew more and more from the day to day operations." Musial was also a 1/3 partner in Redbird Lanes, right at the border of St. Louis by the River Des Peres at Gravois and Germania. 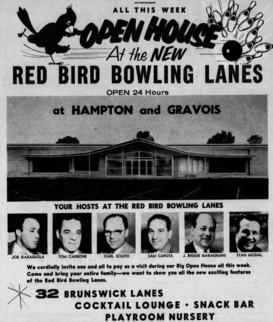 Joe Garagiola, another St. Louis Cardinal and former city resident, owned another 1/3 of the bowling alley. This was a 24-hour bowling alley! We need that today. In a bitter ending, Garagiola sued Musial in April 1986 for mismanagement and requested the companies Musial and Garagnani held be liquidated. They settled out of court eight months later and the restaurant closed. Red Bird Lanes closed in 1996 and was sold to Walgreen’s. I bowled there, but don't remember it being overly cool. Now Carriage Bowl, the alley on Arsensal at Kingshighway where another Walgreens sits was very cool. Redbird Lanes was in business for 37 years. Stan Musial was a real St. Louis citizen for 17 years living in a ranch in St. Louis Hills. Not just an all time Cardinal great, but a resident of the city, a city business owner and a public figure. He's in nearly every list of top 25 baseball players of all time. He was a veteran. By all reports, he was a good father and husband. Older PostStltoday.com now charging a monthly fee - what next?